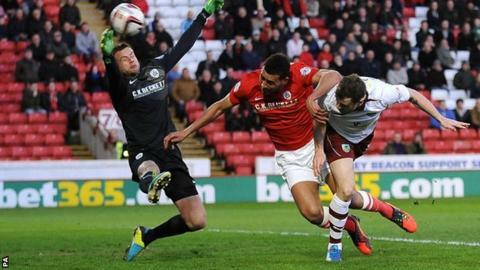 Burnley took another big step towards promotion to the Premier League with a win at relegation-threatened Barnsley to move them 11 points clear in second. The Clarets could seal promotion with a win over Middlesbrough on Saturday, if Derby lose to Huddersfield. At Oakwell, Ashley Barnes flicked Michael Kightly's cross into the net with his head for the opener. He also had an offside goal ruled out as Burnley extended their unbeaten away run in the Championship to 10 games. They have won five of those games to move within six points of already promoted Leicester - who were beaten at home by Brighton. Barnsley, who had won two of their previous three games but failed to score in any of their last three home matches, are second from bottom with a five-point gap to safety. The visitors, who welcomed top scorer Danny Ings back into the team after injury, started well and deservedly took the lead on just seven minutes with their first attack. Kightly's near-post cross was met first by Barnes, who glanced his header into the top corner. Barnes then had a goal ruled out for offside before Jacob Mellis and Dale Jennings shot over for Barnsley. Scott Arfield had a shot blocked for Burnley after the break as the visitors stayed solid to secure another valuable win. "We're disappointed, of course we are. Anything we could have taken off the team who are second would have been a real confidence booster for us. "But we move on to Bolton on Saturday. There is still great belief. There's six games to go, 18 points to play for, which is a lot at this stage. "We're still in with a chance, but it's down to ourselves. It's whether we believe or not that we can push it over the line and I certainly do." "The next game for us is a big one. We've been focusing on it all season and that won't change. "They're all tough games, so we'll be preparing for it. "I've already told the players to enjoy tonight, but we're already prepping, recovering already and getting ready for the weekend. "The outcome was the main part we were looking for - to come away from here with a 1-0 victory, a clean sheet and our keeper's not had a save to make." Match ends, Barnsley 0, Burnley 1. Second Half ends, Barnsley 0, Burnley 1. Foul by Reuben Noble-Lazarus (Barnsley). Chris Baird (Burnley) wins a free kick in the defensive half. Attempt missed. Jean-Yves Mvoto (Barnsley) header from the centre of the box is high and wide to the right. Assisted by Thomas Kennedy with a cross following a set piece situation. Substitution, Burnley. Keith Treacy replaces Danny Ings. Tomasz Cywka (Barnsley) wins a free kick on the left wing. Foul by Chris Baird (Burnley). Dean Marney (Burnley) is shown the yellow card. Substitution, Barnsley. Paddy McCourt replaces Martin Woods. Attempt missed. Michael Kightly (Burnley) right footed shot from outside the box is high and wide to the left. Foul by Martin Woods (Barnsley). Martin Woods (Barnsley) wins a free kick in the defensive half. Foul by Dean Marney (Burnley). Attempt saved. Ashley Barnes (Burnley) header from the centre of the box is saved in the top centre of the goal. Assisted by Chris Baird with a cross. Attempt blocked. Danny Ings (Burnley) right footed shot from the centre of the box is blocked. Assisted by Scott Arfield. Attempt saved. David Jones (Burnley) left footed shot from outside the box is saved in the centre of the goal. Assisted by Scott Arfield. Foul by Chris O'Grady (Barnsley). Jason Shackell (Burnley) wins a free kick in the defensive half. Scott Arfield (Burnley) wins a free kick in the defensive half. Corner, Barnsley. Conceded by Michael Duff. Ryan McLaughlin (Barnsley) wins a free kick in the defensive half. Foul by Michael Kightly (Burnley). Offside, Burnley. Michael Kightly tries a through ball, but Danny Ings is caught offside. Substitution, Barnsley. Reuben Noble-Lazarus replaces Jacob Mellis. Attempt missed. Martin Woods (Barnsley) left footed shot from outside the box misses to the right. Corner, Burnley. Conceded by Luke Steele. Attempt saved. Michael Kightly (Burnley) right footed shot from the left side of the box is saved in the bottom right corner. Assisted by Ashley Barnes. Foul by Stephen Dawson (Barnsley). Dale Jennings (Barnsley) wins a free kick on the left wing. Foul by Danny Ings (Burnley). Corner, Burnley. Conceded by Jean-Yves Mvoto. Chris O'Grady (Barnsley) wins a free kick on the right wing. Foul by Jason Shackell (Burnley). Chris O'Grady (Barnsley) is shown the yellow card.